I once had a conversation with a man who was an official of the Knights of Hermes. He was effusive about the group’s upcoming parade. “It will be the most beautiful ever,” he exclaimed. He also mentioned the parade’s theme, which was one of those obscure classical legends that only two people along the parade route, if that many, would be familiar with, but I respected that. As the man continued I thought that here was an example of the best of Mardi Gras. First, there was a theme that hearkened to days when classically educated men drew from mythology and history to design their parades rather than pandering to the crowds, and then there was the creativity of designing floats to fit the theme. Hermes is one of the groups that does things well rather than some makeshift- off- the- lot parade with rented floats ridiculously forced into a generic theme. That got me to thinking about what might be called the “Quintessential Mardi Gras” – those parts of Carnival life that reflect quality and tradition, that are not about commercialism and that are enduring. Most of what is quintessential is lost the further one gets from New Orleans, but in the city the roses still grow, even among the weeds. Comus began it all, but no longer parades. Following in the tradition are Rex, Proteus, Hermes, Babylon and, among the super krewes, Orpheus. Momus and Comus both fooled with satire back in the politically touchy days of Reconstruction. Momus, who re-introduced the barb in 1977 remains in his den (Carnival-speak for no longer parading) but carrying on the tradition are Chaos, Muses, Druids and LeKrewe d’Etat. Carnival honors Kings and Queens, but it is the Captain who rules absolutely. Dressed knight-like in white and leading a parade the wearer continues year to year authority. This group has been around since 1890, sashaying down St. Charles Avenue on Mardi Gras morning. Other marching groups have emerged since, but the Buzzards, who have their own uptown clubhouse, came first. R&B Carnival songs – "Goin’ to the Mardi Gras," "Mardi Gras Mambo" and "Carnival Time"
Mardi Gras has inspired music in many genres including Jazz, country (the original version of "Mardi Gras Mambo"), Cajun and more. But it’s the R&B songs that are played over and over every year. They are like robins whose appearance is a harbinger of the new season. Professor Longhair’s “Goin’ to the Mardi Gras” has that impossible to keep still to beat; the Nevilleish Hawkette’s version of “Mambo” put Gert Town on the map and the staccato blasts at the beginning of Al Johnson’s “Carnival Time” introduce carnival’s liveliest beat, albeit one that talks about a barroom fire on Mardi Gras. Who cares? It’s Carnival time! There is no sharper band in all of Carnival than the local Marine Reserves band. The musicianship and the movements are perfect, both in parades and at Carnival balls. Carnivals greatest confederation of mixed maskers ascends from the streets of Marigny and then crosses the Quarter toward Canal Street providing a procession that totally captures the sprit of Carnival. 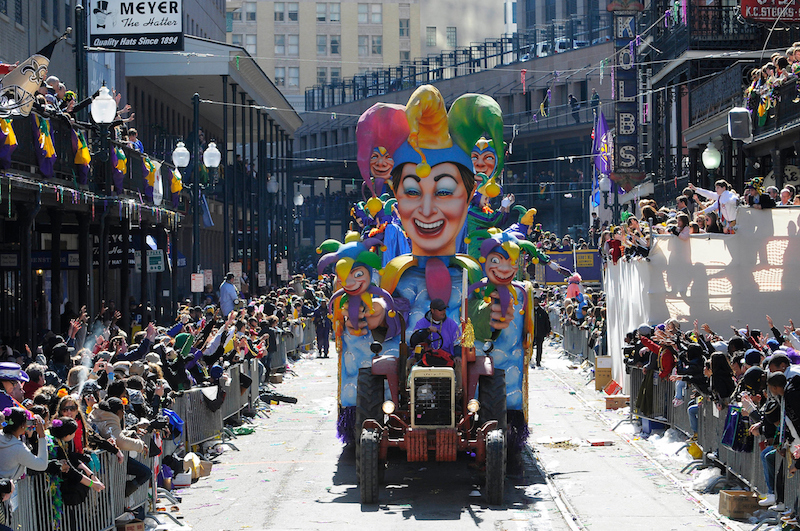 “Lundi Gras” has become part of the common language of Carnival since Rex restarted his annual tradition of arriving by boat. There is still majesty in seeing a king arrive. Lately Zulu has visited him – and the partying begins. A once very isolated practice got national attention with the HBO series “Treme” whose storylines included the plight of a Mardi Gras Indian Chief. The New Orleans tribes are certainly worthy of sociological attention, but we appreciate that they also cling to their neighborhood roots. In the streets of Uptown and the 7thWard they provide feathery flashes unlike anything else seen in Carnival. Your flag boy: "I'm gonna set your flag on fire." Among the “throne floats,” those that the monarch rides, Proteus’ with the sea god theme is one of the most magical. Just as Rex, when it staged its first parade in 1872 allowed more participation from “miscellaneous” maskers, Muses has created the opportunity for new and creative groups to take to the streets. Some of the freshest participants in carnival are marching between the floats in Muses. Dressed in waves of purple, green and gold these masked riders are among Mardi Gras morning’s most striking sights. A great touch of the old Carnival. Sparta’s King’s float sets a good example. Self-described as the “Grande Dame” of gay Mardi Gras, this krewe has moved into its second half-century. It is to gay Carnival balls what Comus was to establishing parades and traditions. Much of what was to follow was shaped and influenced by the earlier group. With the canopy of oaks, the wide median and the charm of the surroundings there is no better place in the world for watching a Mardi Gras parade. Snared beads dangling from the trees throughout the year provide testimony that this is the favored route of carnival’s march. What began as a 19th century burlesque song has been modified into marches, waltzes, jazz and more and the lyrics have taken on new meanings, yet Carnival’s anthem works both as something that is easy to dance to or to accompany a royal march. Is there a batter Carnival song? If, so may the grand duke Alexis ride a buffalo through Texas. Initially devised by Rex from the laws of heraldry the colors are a perfect blend that is both royal and celebratory. Plus no other sovereign has the same tri-colors. In the beginning there was Comus creator of traditions and then cam Rex, the people’s monarch. At the end of each Carnival season the people symbolically bow to tradition, and in the world of Carnival, that’s how it should be. Once near extinction, Le Krewe d'Etat and Orpheus have created new ones to go along with the vintage torches owned by Proteus. The glow of the lights creates a golden hue ideal for illuminating floats and visually returning the moment to antiquity. What secrets remain there? Do the dusty remains of the former Comus, and Momus parades still stand? Is there life among the Chaos? For a carnival to be quintessential, there must also be some mystery.